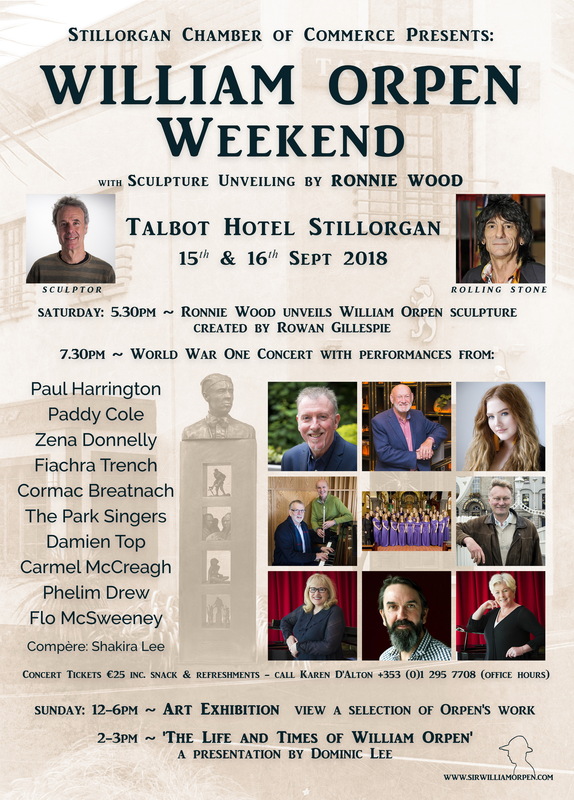 An exciting weekend of events celebrating Sir William Orpen is taking place in the Talbot Hotel Stillorgan this September 15 & 16, 2018. Born in Stillorgan in 1878, Sir William Orpen is one of the finest portrait painters of the 20th century. A sketch created by Orpen in 1916 entitled A Dream: “I imagine that Dublin has seen fit to honour me” is set to become a reality, with the eleven foot tall Bronze Sculpture of Sir William Orpen now complete. Sculptor Rowan Gillespie created the bust using one of Orpen’s famous self-portraits along with photographs of one of his Grandsons – James Birkin and his Great Grandson – Danny Olivier. The Mount Merrion Residents Association contributed €1,000 towards the fabrication of the Ronan Gillespie Artwork and the MMRA name will be recorded. 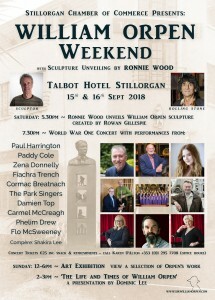 For concert tickets please contact Karen D’Alton on (01) 295 7708 (office hours).